I have updated the GTFS data for both the tripplanner and on the GTFS Data Exchange. This adds in support for loops. This means we are now starting to support the DART trolley routes! Additionally, this adds in block support which dramatically improves routing in cases where the rider needs to stay on the bus when the bus changes from an outbound to an inbound route. For example, the US31 route travels down US31 until it the Galleria Mall. At the Galleria Mall, the outbound trip stops and the inbound trip begins. However, on the inbound trip, the bus leaves the Galleria, and instead of going back the way it came, it loops up through Lorna road before eventually meeting up with US31 and continuing back to Central Station. This means if you are somewhere on US31 and want to go to downtown, you actually need to catch the outbound bus, ride it to the Galleria, stay on the bus as it switches to the inbound route, and ride it to downtown. 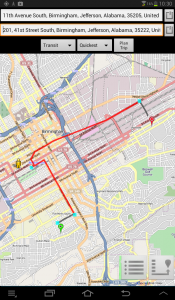 Without the blocks, the routing algorithm was having trouble switching from outbound to inbound, and assumed the rider must exit the bus and make the transfer. Because the transfer time is less than 1 minute, the algorithm would tell the rider to get off the bus, and wait 30 minutes for the next bus! This is now fixed, and the algorithm now knows that the rider can stay on the bus and continue to Central Station. This should help along any of the routes that have loops. 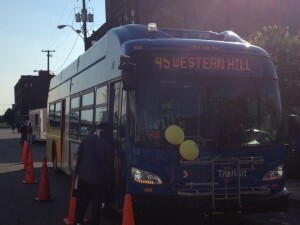 In recognition of “National Dump the Pump Day” yesterday, the BJCTA showed off one of their new buses. I must say the new buses look great! 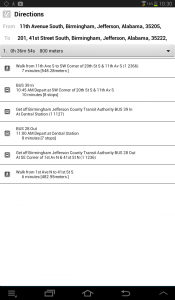 I have released a new version of the BJCTA Trip Planner for Android phones. This includes a few small fixes to the geocoding and starts the app centered on BJCTA’s central station, instead of some random location in Nebraska. As always, get it for free from below or in the Google Play store. As I have been working on cataloging the BJCTA bus stops and generating route data, I have been posting it online at the gtfs-data-exchange for anyone to use. While major companies like Google won’t pick up on this data until it is certified by the agency, smaller 3rd party applications are. Over the weekend, HopStop updated their app and included my transit data for the BJCTA buses. HopStop has free apps on Android, iPhone, and Windows phone devices. While I have released my own trip planner for android devices (BJCTA Trip Planner), I don’t yet have one for iPhones or Windows phones, so I’m glad to see 3rd party apps incorporating my data! If anyone knows of any other 3rd party apps that have picked up my GTFS data, please comment! I have created a Trip Planner app for Android phones. 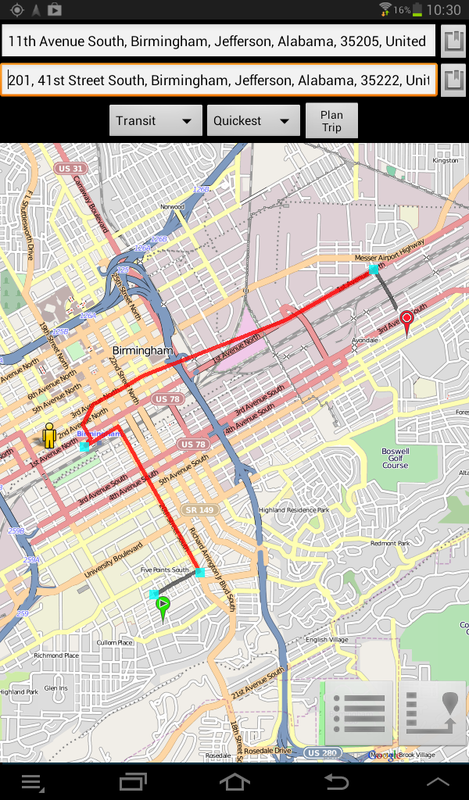 This was based on an open source OTP project that I was able to modify and customized to run against my trip planner. It costs nothing and has no ads. Please give it a try an let me know if you like it! 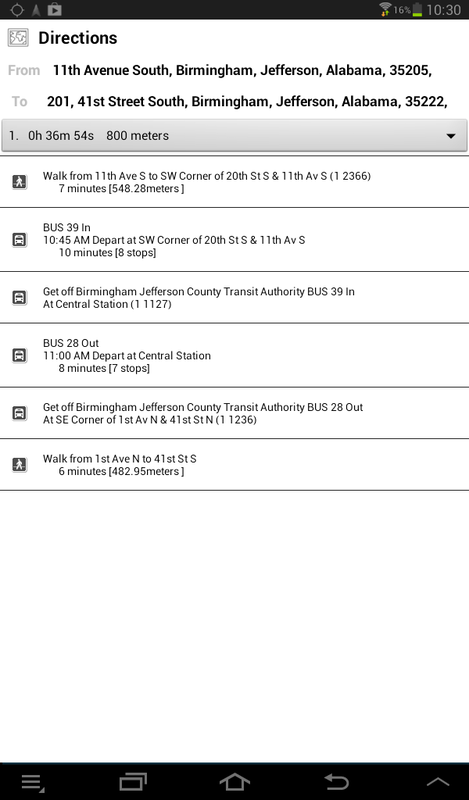 It is available in the Google Play store under the name BJCTA Trip Planner. You can learn more about it from the link below.